The Go Lokal! team, led by DTI-Trade and Investments Promotion Group (TIPG) Assistant Secretary Rosvi C. Gaetos (third from right) and former TIPG undersecretary Nora K. Terrado (fourth from right), receives the “Most Innovative Idea Award” at the SPRints 2017 Huwarang DTI on January 31, 2019 at the Philippine International Convention Center, Pasay City. 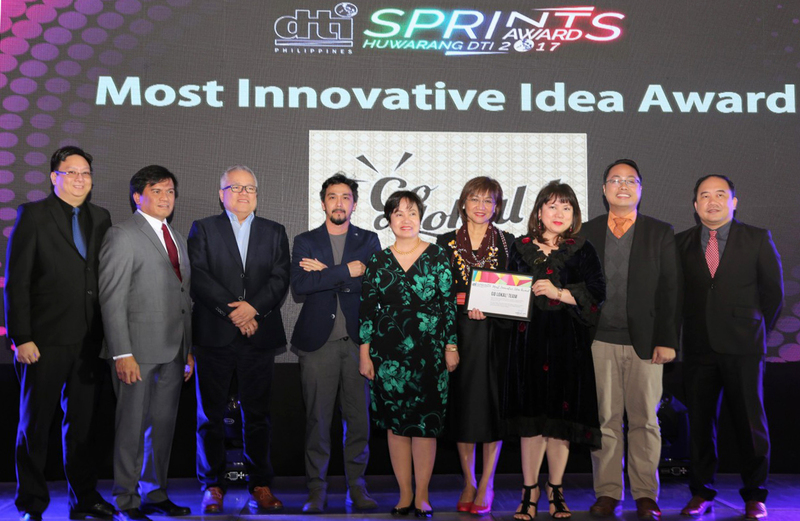 The SPRInts or “System for Performance, Rewards, and Incentives” is an annual search for top performing DTI executives and employees whose notable contributions led to the agency’s improved work conditions and services. Joining Gaetos and Terrado (from left) are: Planning Management Service Office-in-Charge Robert Alvin T. Arceo, Management Services Group Undersecretary Ireneo V. Vizmonte, Trade and Industry Secretary Ramon M. Lopez, product specialist Stanly Ruiz, Bureau of Domestic Trade Promotion Assistant Director Marievic M. Bonoan, consultant Leon Flores, and Human Resource and Administrative Service Director Joel R. Cruz. DTI Secretary Ramon Lopez (fourth from left) with the DTI Executives and awardees of the Huwarang DTI Employee of the Year 2017. From left: Regional Operations Group (ROG) Undersecretary Zenaida C. Maglaya, ROG Assistant Secretaries Demphna Du-Naga and Blesila A. Lantayona, TIPG Assistant Secretary Rosvi C. Gaetos, and former undersecretary Nora K. Terrado.